Driving from Rome to Ravenna in Emilia-Romagna feels a bit like going to another country. Apart from the language, everything is different: the landscape, the way the city is organised, the architecture, the houses and to some extent the food. Ravenna, today a medium-size city on the Adriatic coast, was once an important centre in the peninsula. It became the capital of the Western Roman Empire in 402, when Emperor Honorius, the first to rule over the Western part only, decided to transfer the seat of power to the coastal city to protect himself from the Visigoth king, Alaric I, who had just entered Italy. In those troubled times, the Empire had been divided by Honorius’s father Theodosius I, who gave him the Western part and the Eastern part to his brother Arcadius. Ravenna remained the capital even after Alaric’s sack of Rome and the subsequent fall of the Roman Empire in 476. Following the barbarian invasion, the Ostrogoths decided to settle there with their leader Theodoric the great, who at his death in 526 was succeeded by his daughter Amalasunta. She was herself killed in 535. That marked the end of the Ostrogoth rule, and soon after the whole peninsula was invaded by Belisarius, the famous general of Byzantine Emperor Justinian, and Italy became a Byzantine province with Ravenna as the seat of local government. During the 5th and early 6th century, the city flourished both as political and cultural centre as can be seen from the amazing artistic legacy left to us, in particular the refined mosaics. They alone justify a trip to the city. Among the most important ones are those of the Basilica of San Vitale and adjacent mausoleum of Galla Placidia, Theodosius’s daughter and Honorius’s sister. Galla Placidia was taken from Ravenna to Gaul by Alaric during the 476 sack of Rome, and later married his successor Ataulf. At her husband’s death she rejoined her brother in Ravenna, and started playing an important role in promoting the new religion and the arts. She was also involved in politics at the head of the Western Empire but played a rather controversial part. 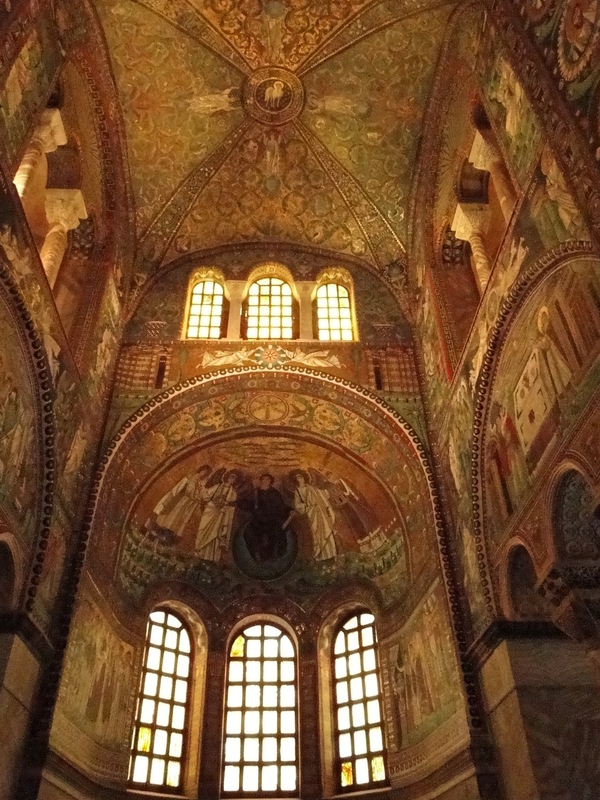 Her mausoleum, built in the mid-5th century in the shape of a latin cross, is one of Ravenna’s oldest building. The very delicate mosaics are mostly on the theme of Christianity, showing how new and fervent the religion was at the time. 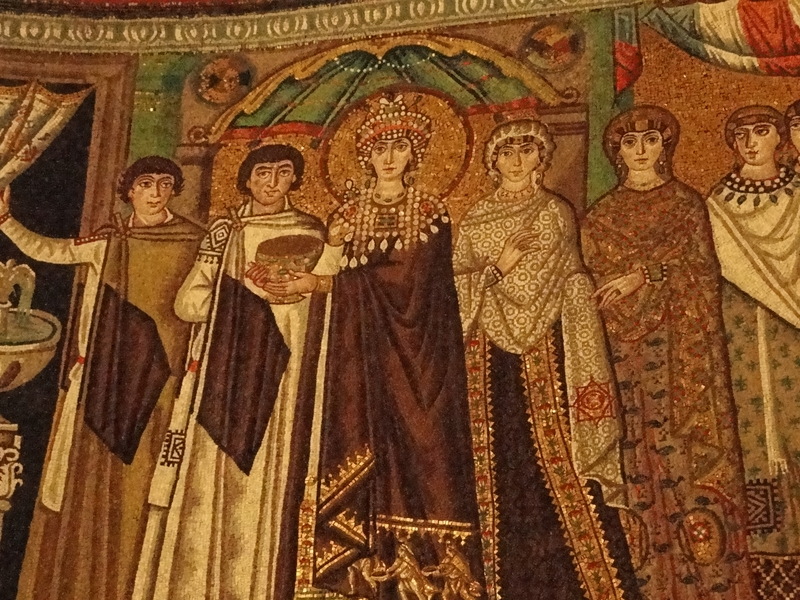 In San Vitale, a Byzantine figure of Christ stunningly dominates the inside of the church, while on his right Emperor Justinian is represented with his aides and opposite him, his wife Theodora and her court ladies. Justinian has a golden halo surrounding his head, to recall that of Christ on the central panel. He was considered as his representative on earth. Scenes from the old and new testaments ornate the side panels. The four evangelists, St Luke, St Mark, St John and St Matthew, appear on the vault each with his distinctive attribute. They frequently appear in other churches in Ravenna. San Vitale, which has an octogonal plan, is one of the most important example of early Christian Byzantine art and architecture, and one of the few to have survived from the Justinian period. It was started in 527 under the Ostrogoth rule and completed in 548 when Ravenna had become part of the Byzantine empire. 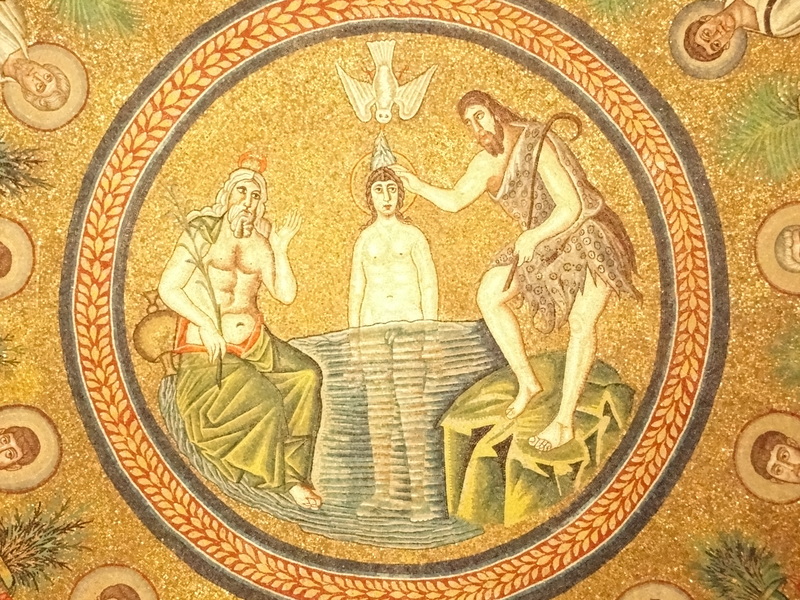 Other treasures include the Arian Baptistry which features an usual mosaic of the baptism of Christ by St John the Baptist. To the left is God the father, who together with Christ and the Holy Spirit dove above his head represent the Trinity. It is a very rare image in an Arian temple, as Arians didn’t accept the doctrine of the Trinity. The modern city has a very pleasant atmosphere too, relaxed yet vibrant enough to enjoy spending a few days there. The centre is relatively small, so people move about by bicycle. In many ways, it is the opposite of Rome. 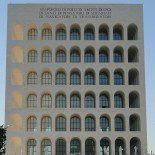 This entry was posted on May 5, 2011 by Salambo in Ancient Rome, Arts and culture, English, Travel outside Rome and tagged gallia placidia, Honorius, Justinian, mosaics, ravenna, Rome, san Vitale, theodorico, western roman empire.